One of the things that makes Yuri!! On Ice just so damn good is the characters. Our main three characters are so well written, with so much depth, that it’s easy to fall in love with them. Because we know them. So why don’t we try to get to know them even better with a Myers-Briggs Personality test each. ISFJ’s are highly concerned with the feelings and opinions of the people around them, which we know Yuuri to be. Defenders often underplay their accomplishments and hold themselves to high standards. They also spend a lot of time crying in a bathroom stall after embarrassing themselves in front of an audience. Yuuri is both imaginative and hardworking and can be very enthusiastic when motivated. He also makes few bonds to other people in his life due to his shyness, but when he does connect with someone, he cares for them deeply (i.e. Phichit, Victor, Vichhan). Defenders have been known to repress their emotions until the point of outbursts. This aligns with how Yuuri handles conflict or heightened emotions. Like when he makes an impassioned promise to skate with Eros. Or when he makes an impassioned declaration to win the gold medal with love to the press. 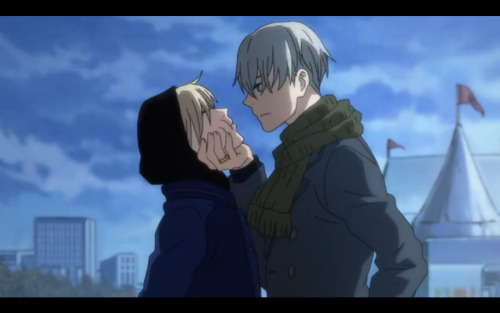 Or when he starts yelling at Victor before a particularly nerve wracking skate (when Victor wasn’t being that helpful). Yuuri, my dude, get it together. ESTP’s are the kind of people who walk into a room and just own it. They’re charismatic and charming as all hell but they also get stuff done. And if that ain’t Victor Nikiforov, I’ll eat my hat. Entrepreneur’s need to be stimulated, need to pursue drama, passion and pleasure, even if that leads to a risky lifestyle. And I’m pretty sure Victor has “Rules were made to be broken” tattooed on his lower back. Victor might be the definition of “extra,” but he’s also a smart and practical man. You don’t get to be a world class athlete by living the party lifestyle 24/7. He works hard on his passions. Victor is made up of the ESTP’s weaknesses too. He can be insensitive or impatient with the feelings of others, like being unable to handle other people crying. He also doesn’t take a whole lot of consideration into how his risky actions can affect the people around him. Like his coach Yakov for example. Yakov puts so much work into Victor's career and what does Victor do? He ups and leaves Russia, abandoning Yakov, to find himself a Yuuri. The one place I see a difference between the Entrepreneur personality type and Victor is how they handle their romantic relationships. ESTP’s have a harder time with long term, committed relationships, as they are easily bored and in need of excitement. But Victor is 100% head over heels for Yuuri. I think this may have to do with the fact that Yuuri is a part of Victor’s work. Entrepreneurs devote a huge amount of their passion towards their goals and Yuuri’s success is one of Victor’s goals. He’s so heavily intertwined with that part of Victor’s life, his relationship with Yuuri has the potential to be everlasting (or we riot). There really isn’t a personality type called “The Angry Brat,” so Yurio technically falls under The Executive. Yurio is incredibly dedicated and strong-willed. Throughout the show, we see him continually push himself to be the best. The boy knows what he wants and he’ll do whatever he has to do to get it. He’s also very direct with his feelings, making no attempt to hide his anger for the sake of those around him. Executives are very loyal people, once they find a person they respect. Yurio is incredibly stubborn, refusing to bend to the will of anybody unless he directly sees it benefiting him. Just like his fellow ESTJ’s, he has a hard time getting himself to relax and has an even harder time expressing emotion. Not that he won’t tell you exactly what’s on his mind, but he considers showing any softer emotion than pure rage a weakness. Even his feelings towards Victor or Yuuri, that most people would express as positive emotions, he has to spew them out as anger. For example, when he wanted to give Yuuri some of the food his grandfather made, he had to physically assault him before offering any. Or when he has to physically assault Victor before expressing concern for his career choices... and ends up insulting Yuuri. The latter did not go very well for him at all. "You be nice to my anxious pork cutlet bowl boy. Do you share a personality type with any of our figure skating faves? What personality type do you think some of the other characters have?